A Karma wedding is a promise made in paradise. Our extraordinary resorts offer a choice of sublime settings in which to say, ‘I do’. Whether it’s the exotic beauty of Bali, the European luxury of the Scilly Isles or the South of France, or the tropical shores of Thailand, we will ensure your special day is an extraordinary experience. Our team of friendly and knowledgeable wedding coordinators can organise every detail of your dream day, from the ceremony and venue to accommodation and entertainment for you and your guests. We understand that a wedding is the start of one of life’s greatest journeys. Begin your adventure at Karma. Set on a lush hillside, just moments from the fine white sands of Bali’s Jimbaran Beach, our five-star boutique resort is a sumptuous location to celebrate your wedding. From a ceremony with an incredible valley view to a luxurious poolside . We have a range of venues, menus and thoughtful extras to choose from, for a truly bespoke experience. An aisle of flower petals to walk on, a couples massage to share, a special wedding night in the Grand Residence at Karma Jimbaran… Romance begins here. Guests, up to 30 seated. Day or night, illuminated by Balinese sunshine or flickering candlelight, celebrate your special moment in the laid-back luxury of our Poolside setting. Guests, up to 50 seated. Say your vows on our stunning shaded teak deck, against the lush backdrop of the tropical Balinese valley beyond. Guests, up to 30 seated. Our brochure also includes details of our food and beverage packages and other wedding options. Karma Kandara’s incredible location, perched on a cliff above a beautiful private beach, was selected by a Feng Shui expert for its powers of good fortune. There couldn’t be a more auspicious place to celebrate the start of your life together. The ultimate wedding, including a welcome cocktail party, reception, three nights accommodation and, of course, an entirely personal ceremony designed for you. Guests, up to 112 seated; up to 150 standing. From the luxury private villa to the infinity pool and terrace with 180° ocean views, Villa Maria is a supreme setting for your ceremony. Guests, up to 50 seated; up to 60 standing. Chic white decor, ocean views and a sun-dappled terrace create a serene atmosphere for your special day. Guests, up to 40 seated or standing. A landscaped setting with lush greenery and tropical flowers creates a discreet and tranquil ambience perfect for intimate ceremonies. Guests, up to 20 seated or standing. Make your vows beneath a bamboo canopy on white sands, serenaded by the gentle lapping of the surf. Guests, up to 120 seated; up to 150 standing. A dreamlike ‘wedding on water’, in which the happy couple and their witnesses appear to walk effortlessly across the surface of our infinity pool. A truly magical experience. Guests, up to 70 seated; up to 90 standing. A fairytale alpine setting, in the enchanting town of Schliersee, provides the perfect backdrop to your special day. Choose an intimate tailor-made wedding in the hotel's hideaway venue or opt for a larger celebration in our spacious room with a view. Speak to our experienced wedding planners to tailor-make your perfect day. Say ‘I do’ in a room with a view: the wall of windows in this spacious venue offers stunning mountain vistas. There’s space for up to 40 guests – or it can be combined with the adjoining room to comfortably cater for 100, including a dancefloor. Hidden away in the heart of the hotel, this stylish room provides the perfect setting for an intimate wedding celebration with up to 16 guests. Personalise the dinner menu and customise the decor any way you wish for your special day. No need to head to the tropics for an idyllic island wedding! There couldn’t be a more romantic spot to say “I do” than Karma St. Martin’s. Our venue holds the only off-island wedding license on the Isles of Scilly, allowing you and your loved one to get married in your choice of three uniquely stunning locations, and then of course there’s our Honeymoon Suite with panoramic views of the sea which is also ideal for hosting intimate ceremonies. Say your vows with loved ones present in our intimate nautical-themed restaurant, with gorgeous ground floor ocean and sub-tropical garden views as a backdrop. Our most popular wedding venue on the 1st floor, The Tean Room suits larger wedding groups. We provide a traditional setup with seating either side of the wedding aisle, leading to breath-taking panoramic floor to ceiling views of a white sanded beach and ocean. 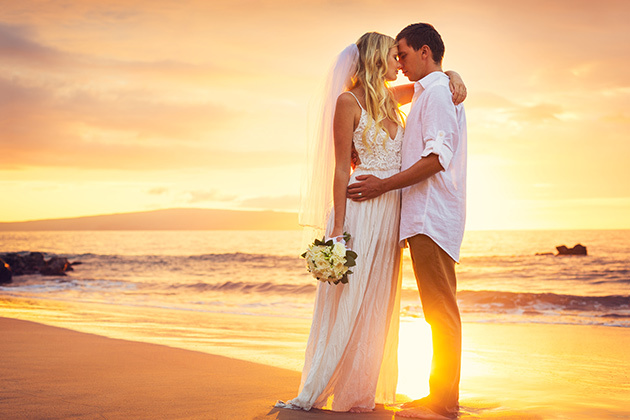 Our license does not extend to the beach for the official aspect of the ceremony, however it is possible to have the legal ceremony in one of our licensed wedding venues, and then we can proceed to conduct a replica service and ceremony outside for you and your guests. Celebrations can then be continued in the hotel gardens or in our fabulous room on the first floor, The Tean Room, whichever suits you and your needs best. Karma St. Martin’s can provide two witnesses, island flower confetti, an intimate candlelit dinner set up in your suite, and accommodation in the Honeymoon Suite. What could be better than tying the knot with your loved ones, surrounded by crystal clear water and Scilly coastline? Marry in the Tean Room… Then lead your guests as newlyweds into subtropical gardens directly on the beach, for a Pimm’s or champagne toast, before you cruise away into the sunset on a jet boat! Return to the hotel for a lobster dinner caught freshly that day, before partying away into the night! Whether you have lots of family and friends, or just can’t bear to cut the guest list any more, don’t dismiss St. Martin’s island as too small! Our Tean Room venue hosts up to 80 guests, and we have accommodation for up to 68 guests, however St. Martin’s island has countless luxury B&B’s, self-catering holiday lets, and even a campsite! Our friendly team can point you in the right direction, and guests can always rest their heads on neighbouring islands, with private late-night boats available upon request. The former home of legendary actress Jeanne Moreau and, later, interior designer Laura Ashley, Le Preverger is a unique private estate that perfectly combines understated modern luxuries with old-world charm. Exchange vows in the picture-perfect setting of the garden terrace, with its sweeping views of the surrounding olive groves, woodlands and vineyards. Elegant wines, fine cuisine and distinguished decor add that discerning touch. We can provide two witnesses; flower confetti; an intimate candlelit dinner in the French countryside, surrounded by lavender and jasmine, as well as, a private chef and accommodation in classic French luxury at Le Preverger. With the finest local Provençal produce (and rosé wine of course), there’s nothing better than tying the knot in the stunning grounds of Le Preverger. Get married in the heart of nature, surrounded by the seasonal blooms of lavender and jasmine. Including flower confetti, and a champagne toast in the gardens at Le Preverger, connect with your loved ones before partying under the stars in this exclusive French idyll! Make a truly memorable entrance to the incredible grounds of Le Preverger by helicopter, meeting your friends and family for a magical day! Have your ceremony over the curved bridge of our elegant swimming pool, accompanied by flower confetti and a champagne toast; a magical evening in the French bliss! Le Preverger has accommodation to host up to 28 guests; however, there are several luxury hotels and B&Bs close by for extra guests! Our friendly team can point you in the right direction. With its stunning white architecture and deep blue seas, the Greek island of Mykonos is a magical setting for your wedding. Invite your guests to share your special day in our eight-bedroom private Karma Estate with three individual villas, where you can exchange vows on the bamboo-shaded terrace next to the infinity pool, with sweeping views across the island's most glorious stretch of sand and the azure Aegean Sea. An intimate ceremony in the magical sun-kissed Karma Pelikanos villa by the infinity pool and overlooking the sparkling waters of the Aegean Sea. Pelikanos can provide two witnesses, island flower confetti, an intimate candlelit dinner with champagne under the stars, and accommodation in our luxury villa. Tie the knot under the tropical island skies of Mykonos with your closest loved ones, including: champagne toast by the glittering infinity pool, bridal bouquet and an exclusive luxury dining experience. Get married in the glorious Mykonian sunshine with a poolside champagne toast. Then enjoy a private sunset cruise with your loved ones, champagne, and wine. Drink in the incredible views and stop off at stunning secluded beaches! Pelikanos has accommodation to host up to 15 guests; however, there are several luxury hotels and B&Bs close by for extra guests! Our friendly team can point you in the right direction. Feel the sand beneath your feet as you say 'I do' on the secret beach at this idyllic island hideaway – a world away from the noise and demands of everyday life. Allow our experienced wedding planners to tailor-make the entire day, including the ceremony with a religious minister. Or if you prefer, we can simply provide the beautifully decorated venue and accommodation. Karma Rottnest is truly a unique destination to say ‘’I do”. Karma offers the perfect setting for your next intimate wedding experience. Our Wedding Coordinator offers a wide selection of packages and a diverse range of event spaces. There is accommodation for guests, golf and a luxurious spa to enjoy. The happy couple receive one complimentary night’s stay. Cocktail and banquet options available. Four different styled reception spaces available. Indoor and outdoor entertainment options. Pre & post wedding wine dinners available. Riva hosts an extensive premium beer, wine, and cocktail list. Return ferries can be organised by Guest Services for all guests.